Part of the Suki-Ya chain. "Suki-Ya has opened its door in 1 Mo..."
Suki-Ya has opened its door in 1 Mont Kiara just a couple of months ago. With much anticipation, I gathered the troop with our hungry tummies to check out what it's all about. The lunch buffet is quite a steal for RM29.80++ per person, I must say. 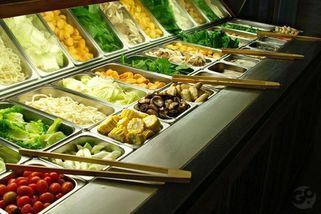 The first thing you'll see when you walk in is a 'salad bar', featuring all sorts of fresh vegetables, some fish balls, and clams. We ordered the Miso soup as well as the Kimuchi soup. Both had pretty good flavours although the Kimuchi soup could be spicier. As for the dipping sauce, my favourite would be the spicy, garlicky misotare sauce. The Gomatare you'd have to speciallly request for, it's basically a very fragrant sesame sauce. Good with the vegetables. Speaking of vegetables. We first start with the harder ones so they will soften completely while flavouring the soup. We filled up plates upon plates of vegetables for a healthier meal. Feel free to order however many trays of meat, but make sure you don't waste them. They offer Lamb, Beef as well as Chicken but we only went for the first two. The Beef bordering on tasteless though, so it was lamb for me. Apart from the savoury stuff, they also have a soft serve station with 2 flavours available: Green Tea and Chocolate. Next to the station are various toppings you can choose. Simple, but pleasant. The service is polite but can be slow when it's busy.